Poland is noted for having some of the finest domestic white goose down in the world, and the down from Ziegler is the best that Poland has to offer. 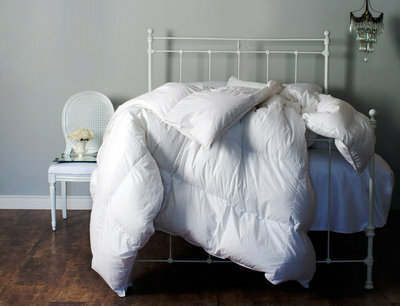 Raised on special farms, Ziegler Polish White Goose Down is noted for its wonderful loft and cozy warmth. With a loft of 850 cubic inches per ounce, it is regarded as the best of all the grades of farm raised down worldwide. This down carries the Zurguard® certification to be Hypoallergenic. St. Geneve Ziegler Goose Down comforters also available in Dual Zone to allow for differing warmth requirements. Contact us for details on this option. St. Geneve imports a wonderful Egyptian Cotton sateen fabric that is woven by one of Germany 's oldest down proof fabric mills. It is light, soft and lustrous. It carries the symbol for German Quality Assurance, the Oeko® certification of purity, and SanProCare® which certifies that it is considerably more breathable than any other cotton. And of course it is permanently downproof. The Ziegler down comforter duvet is St. Geneve's most popular style. It has a wonderful down fill, a wonderful cover, and is beautifully hand crafted. With care, it will last for decades. The down will last for generations, and can be recovered into new casings. This is the duvet that St. Geneve made with very considered choices in its design and materials, to be a duvet that our clients would love to own; worth every penny. I would purchase a good comforter cover if getting this item, but one that is not too heavy. What a great product, great quality and great price.